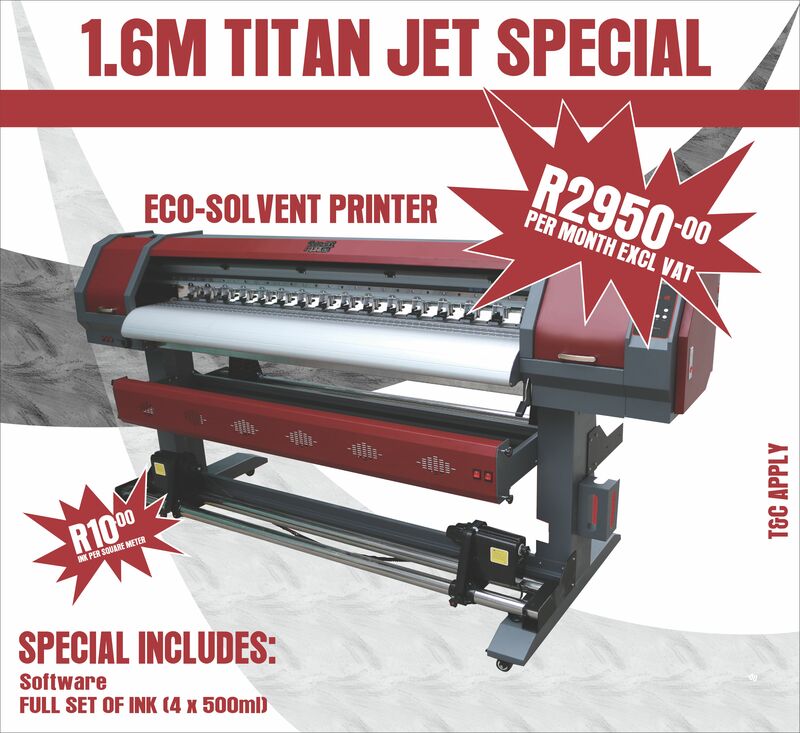 We are proud to be the Africa agent of Titan Jet large format printers and Jet Best inks. With a vision to explore new ideas and a mission to establish great business ethics. The company was started in 2012. One of our main aims was to become a major role player in the large format market place. The following 4 years established us as one of the only smaller brands that can give well after sales service with a great range of printers that is reliable and well-priced. Between the owners there are more that 25 years of signs technical expertise and large format printing knowledge. In the beginning of 2016 we decided to franchise a new branch in the Western Cape and later this year we are planning to open an additional franchise in central Free State. Our Gauteng branch serves as the Head office. The head office handles all imports and exports as well as all the distribution of all printers, equipment, ink and spares in South Africa and all over Africa. We offer a full support and training of customers. Our technicians are able to handle any technical issues and we are always on standby for any support that customers might need. With installation of machines and equipment our technicians train the customer to use their new printing machine. We have customers all over South Africa as well as in Uganda, Zambia and Zimbabwe. Our printers and equipment are reliable, affordable, good quality with a good after sales service thus value for money. Spare parts and our Jetbest inks are distributed all over South Africa as well as the Africa continent. We strive to supply a well selected range of products at value for money prices. Our greatest advantage is that our customers are part of our sales team. Visit our Titan Jet webpage for more info or contact Epila signs directly.